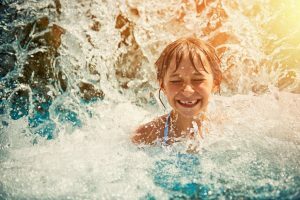 Southern California is full of theme park options, and Great Wolf Lodge is nearby in Garden Grove at 12681 Harbor Blvd. The indoor water park features both adult and children’s spas as well as storytelling events. It’s the ideal spot to keep cool this summer with splash-rich thrill rides, a variety of pools for all ages and abilities, and countless ways to keep entertained. Dining and shopping are an added dose of fun for the adults, and with new special events always being added, you’re guaranteed a howling good time. Head to Ten Paw Alley for bumper bowling with the little ones, or check out the Lazer Frenzy where you’re challenged to make your way through a maze without the beams touching you. Kick back in a Cool Cabana rental between sessions on the Coyote Canyon that drops you four stories down a vortex water slide. The Wolf Tail water slide is whip fast, while the Howlin’ Tornado is a funnel of fun you’ll never forget. At the Wolf Rider Wipeout, it’s indoor surf simulations that’s fun and crazy, or you can check out Fort Mackenzie for an indoor water/treehouse experience. The Scooops Kid Spa is where you can pamper yourself and your little ones with manis, pedis, facials and more. Dine at one of eight destinations from favorite pit stops like Dunkin’ Donuts to the Lodge Wood Fired Grill for steak, seafood, and more. Gather your wolf pack and head over to one of the top-rated parks in town.